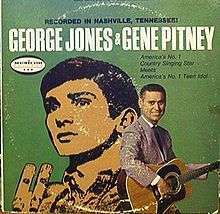 George Jones and Gene Pitney (Recorded in Nashville!) is an album by American country music artist George Jones and rock and roll artist Gene Pitney. The album is also known as It's Country Time Again! This article is issued from Wikipedia - version of the 2/8/2015. The text is available under the Creative Commons Attribution/Share Alike but additional terms may apply for the media files.